What could possibly be better for someone who adores this flower than some well chosen sunflower gifts for her. Send some happiness to someone special when you pick out this particular flower for a gift. Whether you are selecting something for a friend, for a happy and celebratory occasion such as a wedding or for someone who could really do with a little bit of sunshine, a bright and beautiful floral item will make a perfect choice. These bold and bright yellow orange color flowers really can breathe some life and happiness into designs. They work brilliantly for accessories around the home where they can light and lift up the whole mood of a room. 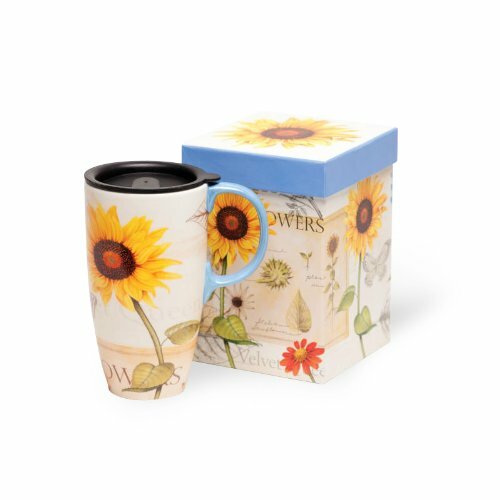 When people already have everything that they need, it can be difficult to think of something to buy for them so let me take on the task of thinking up sunflower gift ideas for you. 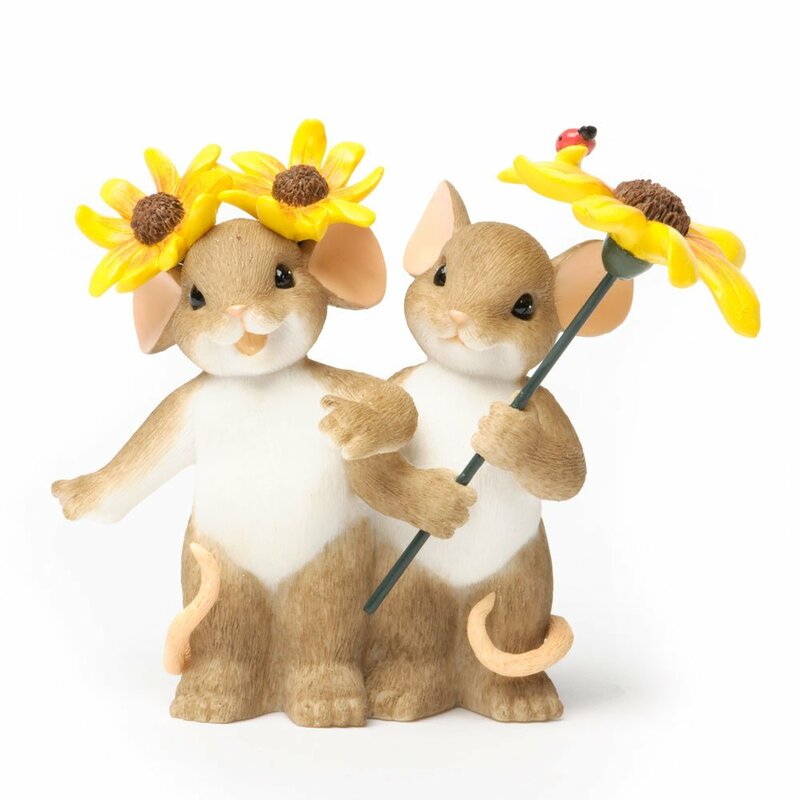 Choosing a special sunflower figurine which will look good in the home makes a really thoughtful present and something that can be kept and enjoyed forever. I like the fact that figurines are nice ways to remember people too. I’ve got some special ones at home which provide many fond memories of family members who are sadly no longer here. 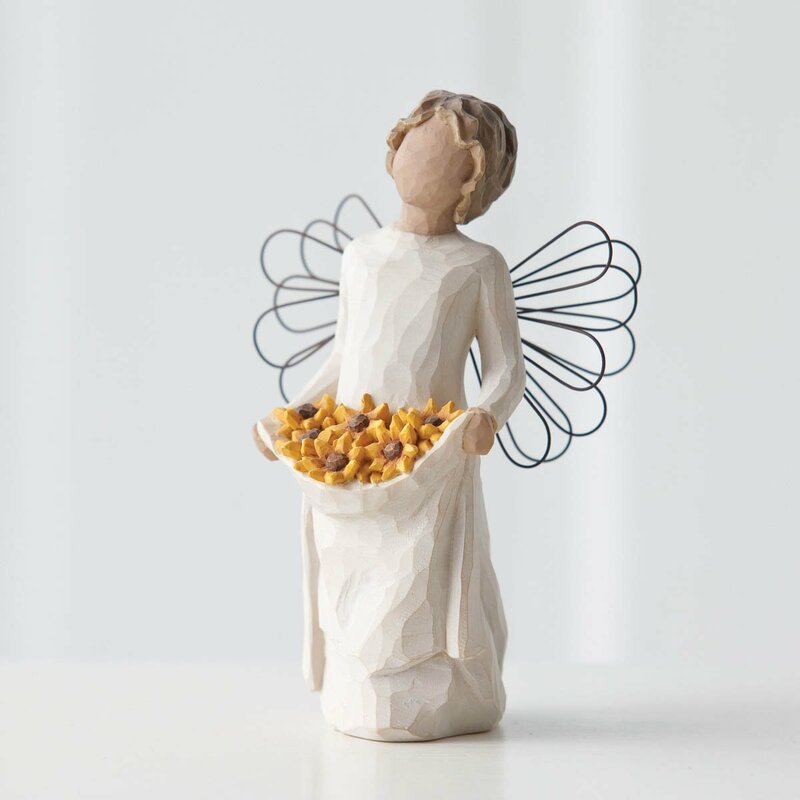 Willow tree angel figurines are immensely popular little sculptures created by the artist, Susan Lord. It’s very easy to see why with their simple yet elegant designs. 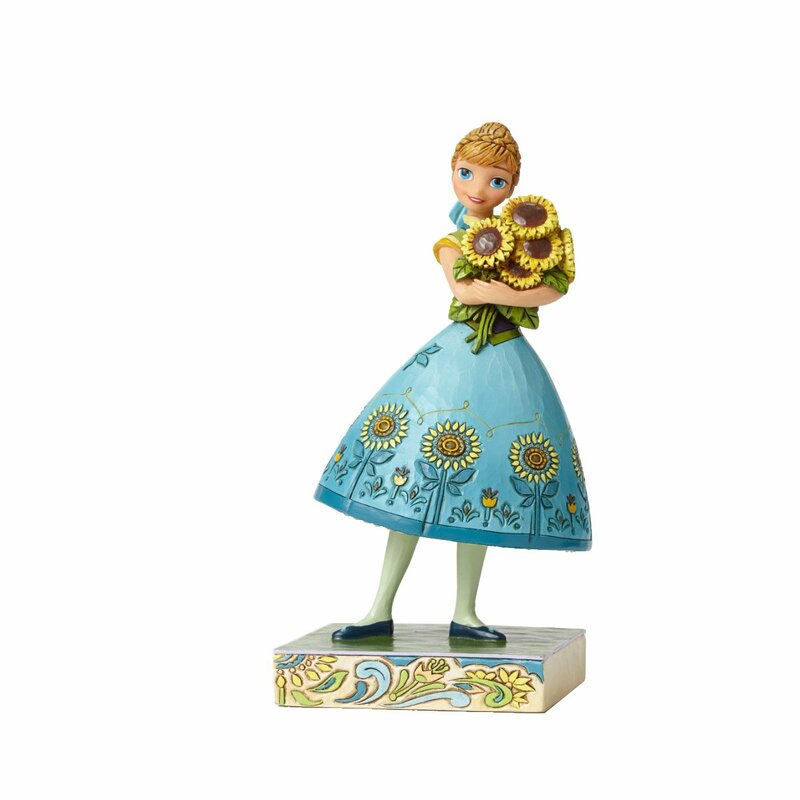 This figurine above is the sunshine angel who is carrying big sunflower blooms in the skirt of her white dress. It’s a simple and elegant decorative piece that is perfect to gift to someone who you want to bring joy to. A wonderful item for a friend, Mom, sister or daughter; these designs make beautiful and lasting sunflower gifts for her. 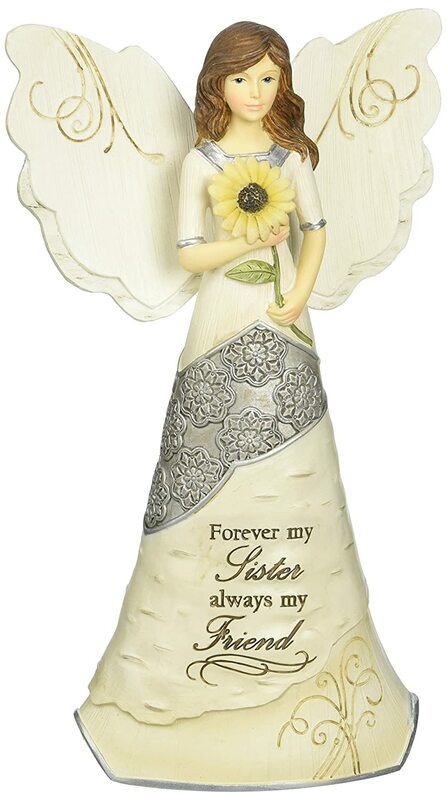 This angel sculpture should add a small hint of color and sunshine wherever she’s placed. I love the fact that Angels are like good luck charms so it is like gifting good luck to someone which is a beautiful thought indeed. The inscription on this angel reads: Forever My Sister Always My Friend. What a wonderful message this will bring to your beloved family member. I love this elegant and beautiful looking figure who carries this delightful sentiment on the front of her dress as well as a basket of sunflowers. She looks exquisite and I believe that a sister would be so touched to receive a gift with such a wonderful sentiment attached to it. A retired angel figurine called Sarah’s Angels with Sunflower was made in the memory of Mrs Sarah Lee who was taken too soon by cancer. The backstory which belongs to this beautiful piece, not shown, is inspiring. It makes it even more of a gift that will touch the life of someone lucky enough to receive it. It makes you think and reflect on just how precious life is. 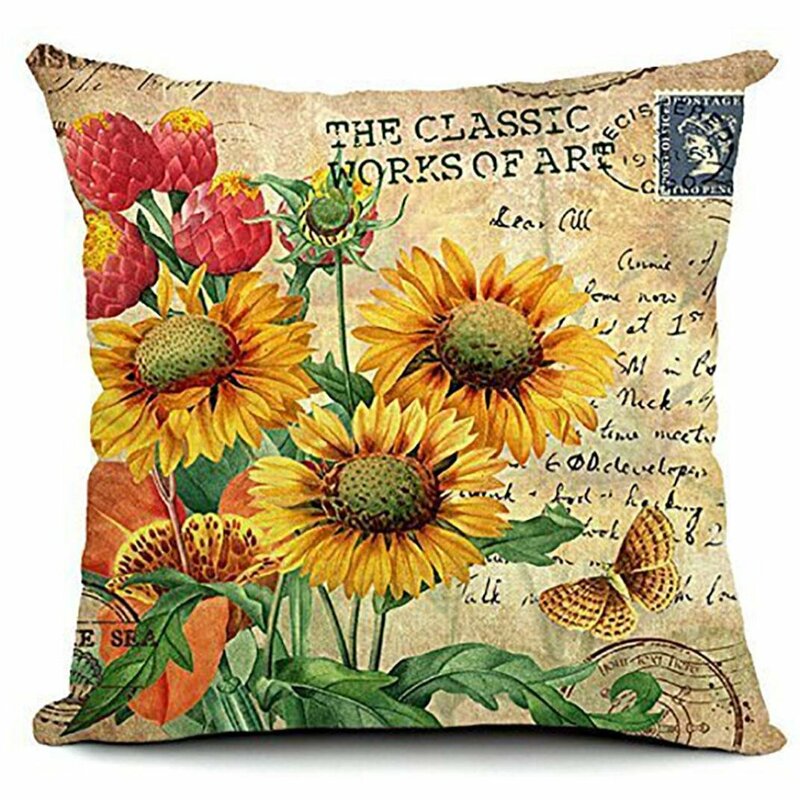 You may find one at an auction site where you can search for sunflower themed gifts. Angels and sunflowers are a wonderful pairing. 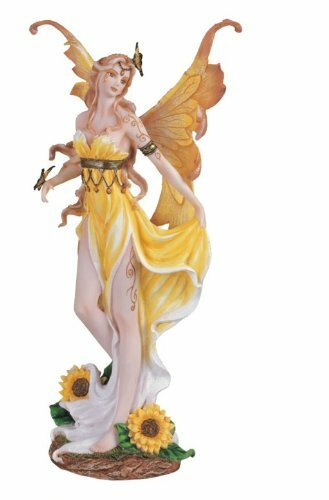 The Sarah’s Angels is a more detailed figurine with a thoughtful and hopeful looking angel clasping a large sunflower in bloom in her arms. I like the added touch of the butterfly on the petals and there are matching, smaller butterflies adorning the angel’s dress. Most kitchens quickly become the hub or heart of a home: where we eat, make food, enjoy breakfast, read the paper, enjoy a chat with friends and family, do chores, or watch the backyard birds from the window as I do. This is a space that will really benefit from the addition of some sunny and bright accessories. Here are a few of my favorites. 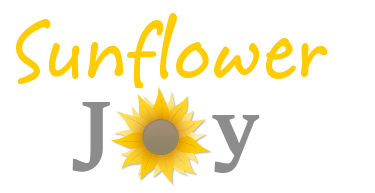 Birds and sunflowers make a great combination because there are lots of birds who simply adore eating the seeds of this magnificent plant. I have to keep my feeders constantly topped up with sunflower hearts which are liked very much by the smaller birds in particular. I also get the pigeons and doves hoovering up any that drop off to the ground too. I love the sweet inscription I saw on a gift boxed item which read: keep your face towards the sunshine. It’s a very positive message and sentiment adapted from a Helen Keller quote. The rest of that quotation reads: and the shadows will fall behind you. 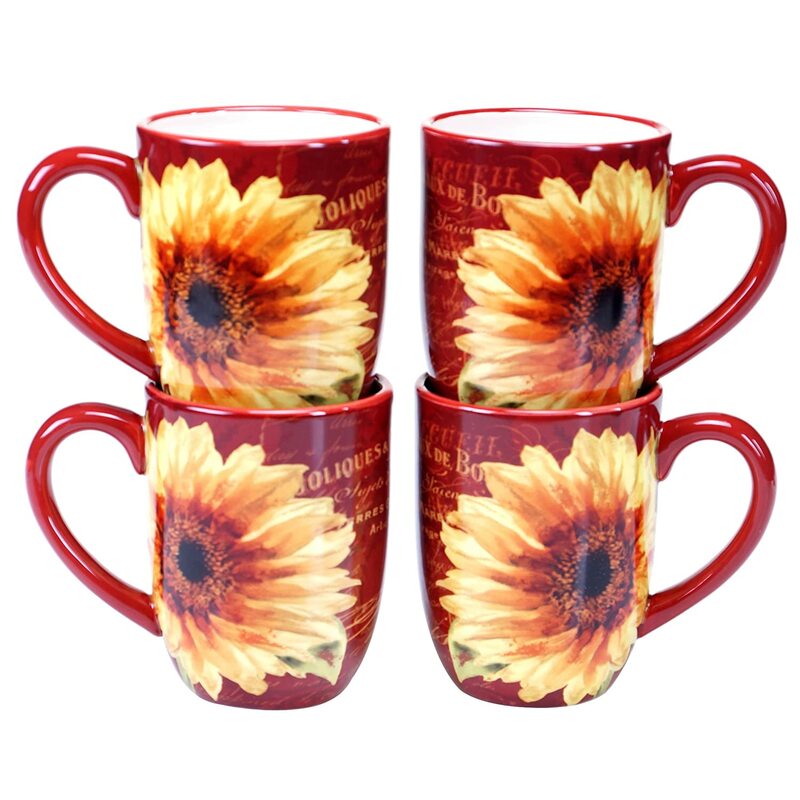 Anyone who adores the sunflower plant should really appreciate a pretty mug design and the stunning colors used in this cheerful product. I like the addition of the bird and bird house inside one of the mugs too. Little details can just finish items off nicely. A mug makes for an item that is not too expensive and one that can be shown off in a kitchen by displaying it on a shelf or hanging from a hook. A glass cutting board makes a nice sized statement piece for the kitchen and what a beauty this one looks to be. I like my glass boards because they look pretty and they wipe spotlessly clean with very little effort. One with an intricate and elegant design such as this artistic looking one with a butterfly is something that can be left out on show all the time instead of stored away. This is a stunning looking engraved chopping or cutting board with the flowers design engraved onto your choice of wood. It is also available to personalize with a name or some text which makes it perfect for gift giving. 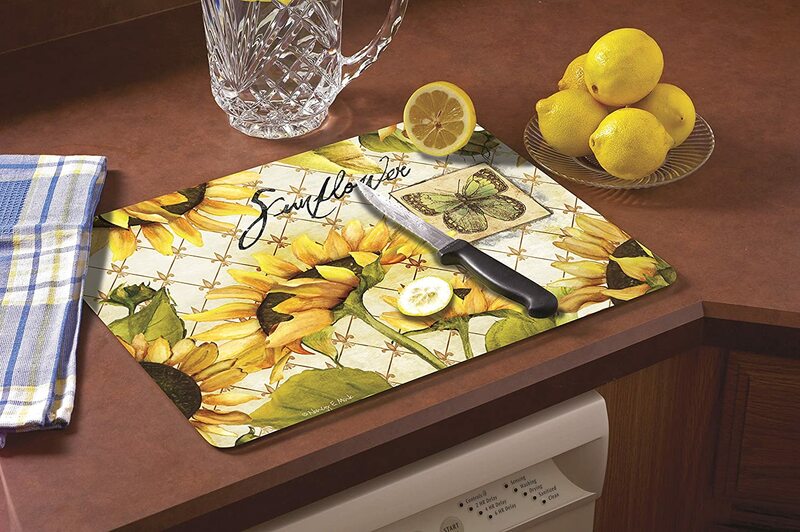 Like many kitchen accessories, is also a practical idea for sunflower items and gifts that you can buy. As well as items such as this beautiful looking cushion cover, there are more cushions and pillows here. 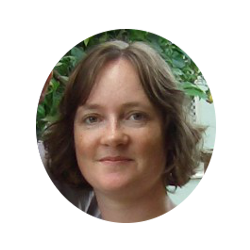 You can also consider sending an extra special item with a product that can be personalized. It just makes it that much more special doesn’t it. I love a pretty looking apron I found, not pictured, with a wonderful design by the artist, Karla Dornacher. The sentiment across the apron is the blessing verse of Numbers 6:24, 25. The Lord bless you and keep you; the Lord make His face shine upon you. 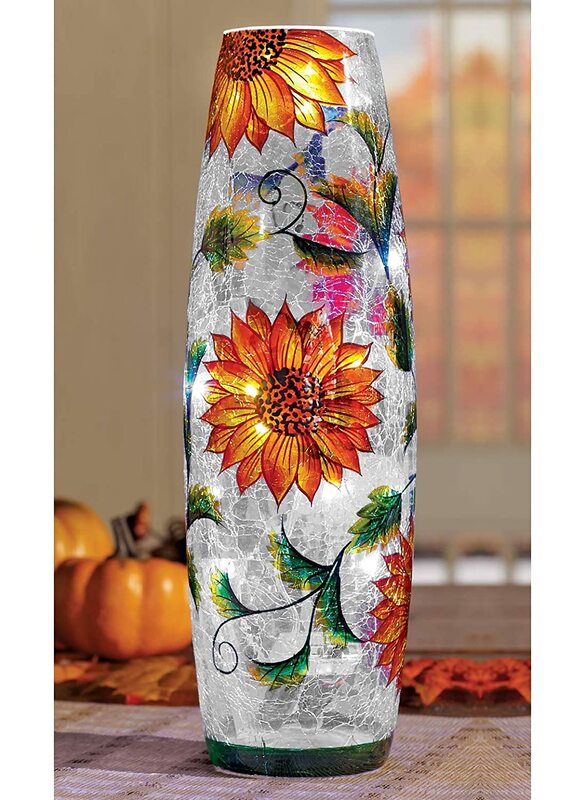 Art glass captures the striking, bright and vivid colors of the sunflower magnificently. These pieces make stunning keepsake gifts that can be enjoyed all year long. Painted glass holds a vibrancy of color that you just don’t see on anything else and then there is the beautiful effect you get when light touches the item and bounces soft hues of color round the room. 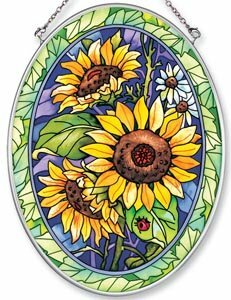 The trio of sunflower blooms is more like the traditional stained glass with the dark color outlines really drawing attention to all the elements of this design. 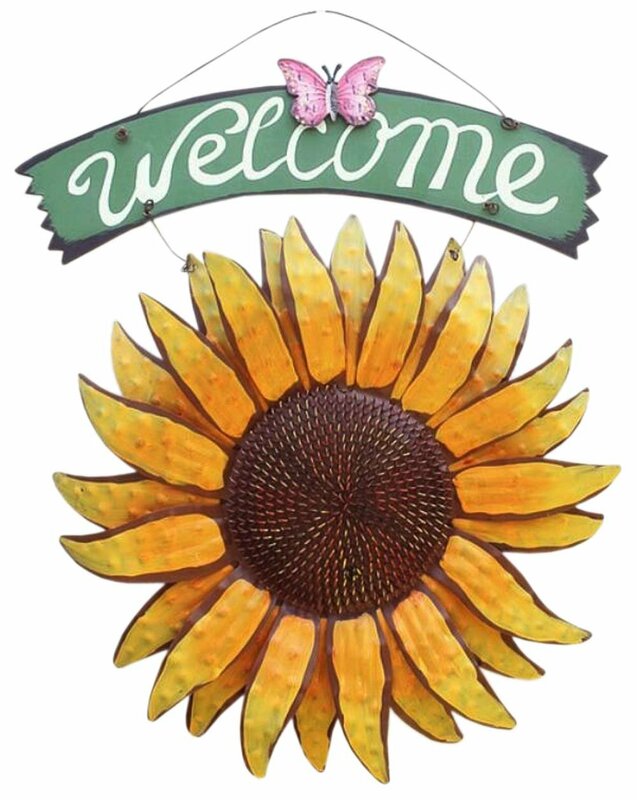 This is a beautiful looking sunflower suncatcher or hanging window panel that features the golden colored sunflower heads set in a background of leaves, foliage and flowers. The colors are particularly striking and rich with this piece. 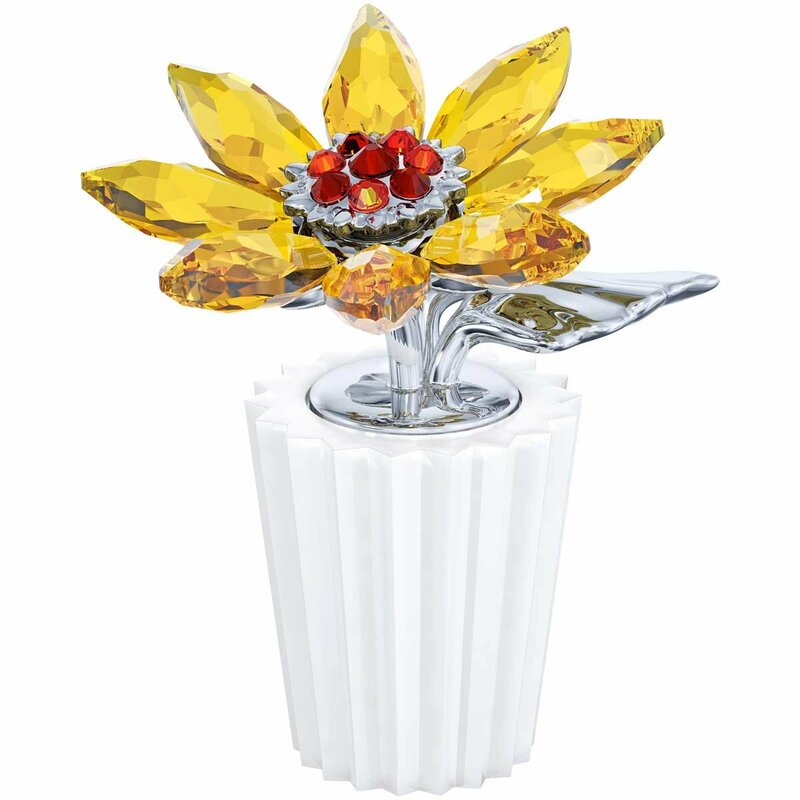 A more luxury keepsake item is a fully functional art glass tray (not shown) which also incorporates a magnificent sunflower design. The lucky recipient can enjoy a taste of a summer themed garden all year long in their home with this out on display. I love these flowers so much that I create my own photo collages which I’ve combined to make a pretty flower design with a butterfly in a handmade Christmas ornament. You could also make something too for an extra special choice of gift. 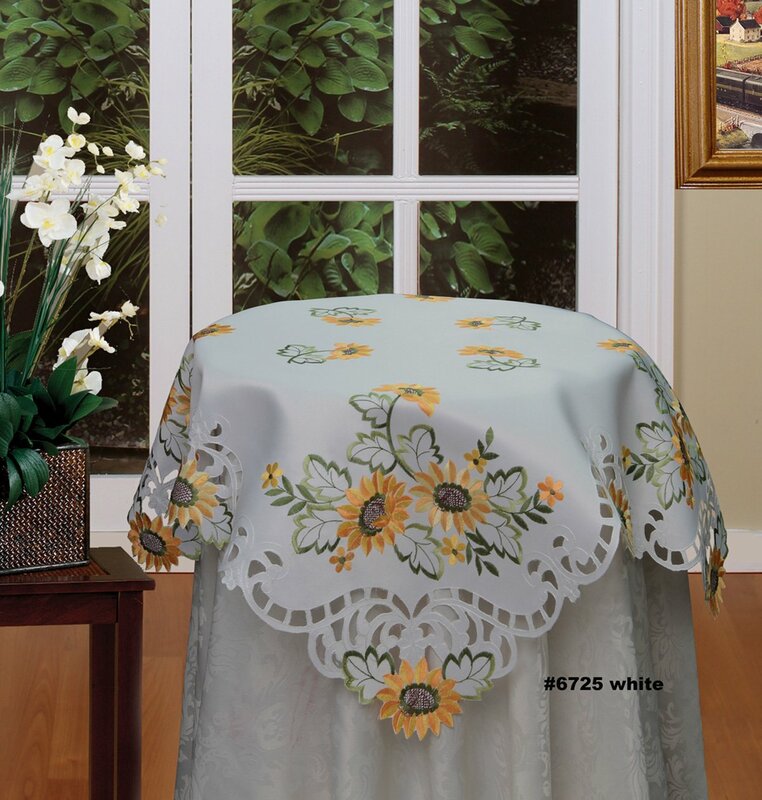 Whatever sunflower gift ideas you like here and whatever item you choose, you can be sure that your choice will spread a little happiness along with it. I have a friend who suffers badly with SAD disorder which is a type of depression brought on by the dreary winter months. Her birthday falls during this time of year too so I always send her a big bunch of sunflowers which she loves so much along with a cheerful matching item. I think there’s nothing better than this wonderful flower of the sun to bring on a smile or two.